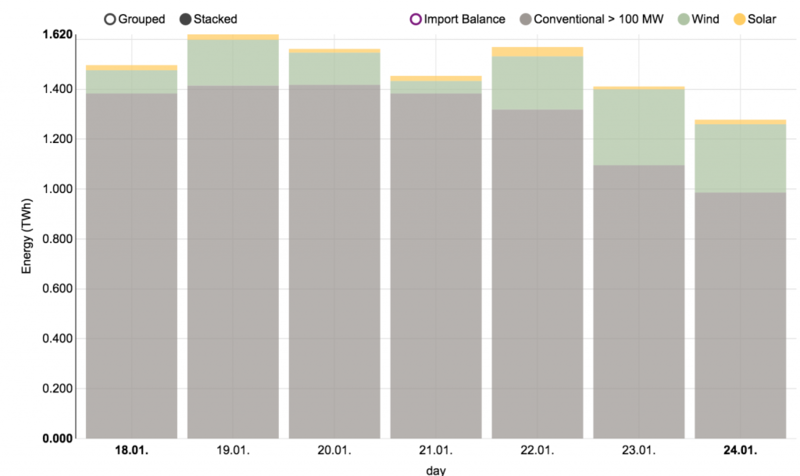 How many batteries does Energiewende need? German energy policy is to base power generation on renewables and phase out nuclear power. The trouble with this, is that there are always some days when there is no wind and no sun. No problem, it is argued, because energy can be stored on very windy days for just these cases. So can battery energy storage really tide Germany over such lull periods? If so, how many standard car batteries would you actually need? German daily energy production for 3rd week in 2016 during low wind speeds. Energy storage would need to replace all ‘conventional’ energy if as planned Germany abandons nuclear and coal. There are currently 1 billion cars and trucks in the world. So Germany’s energy storage solution would need to requisition all of these , plus then manufacture 800 million more just to cover one day without wind in Winter. If instead Germany decided to buy Tesla Powerwall battery packs priced at $3000, then they would only need 220 million of them for a total cost of $660 billion. However for energy security insurance they probably need about seven times that number to cover a full week for a total cost of ~ $4.6 trillion. This entry was posted in Energy, renewables, Science, Technology. Bookmark the permalink. 17 Responses to How many batteries does Energiewende need? It is amazing how a few trivial sums can blast a hole in the bottom of the jolly green boat. Now we should factor in the costs of Energy Storage and it’s replacement every 10 years. Think of all those green jobs that will be needed ! It might actually be cheaper to pay people to dig canals. I think this is just the tip of the iceberg with a project like this. You also need to consider the storage efficiency of the batteries and the fact that car batteries (or similar chemistries) should not be completely discharged and you will then find that you need many more for this application. Obviously, as you comment in answer to the above, the batteries will need replacing every ten years or so. Also, a quick calculation for lead acid chemistry, charging at 14.4 V and discharging at an average of 12 volts, demonstrates that you will only get 83% of the energy out that you put in during charging. This also ignores the fact that charging also puts in more ampere-hours at the higher voltage and I will guess that at about 10%, then we are down to about 75% energy recovery. Pumped storage a la Dinorwig achieves this efficiency without the need for chemical storage mechanisms which need routine, and very expensive, replacement. The Tesla Powerwall of 10 kWh contains at least 22 kg of Lithium (Li power density is 0.4-0.45 kW/kg). 220 million Tesla Powerwalls would equal 4.84 million tons of Lithium. For 5 days this equals 24.2 million tons of Lithium. And that’s just Germany. If the rest of Europe wants to follow, which uses about 4 times the amount of energy used in Germany, you get to 120.1 million tons of Lithium. Obviously there could be some efficiency gains – even in the midst of winter there will be sunshine and wind somewhere, but still, ballpark number is 50-100 million tons of Lithium required. Now, according to UGSG, the world mine reserves of Lithium are estimated at 13.5 million tons, whereas identified Lithium resources are close to 40 million tons. Which is equal to or less than what would be required for just Europe. And that is not even considering the rest of the world. And as if there is no demand for Lithium from elsewhere. And Lithium batteries need to be replace after some time, whereas recycling Li-batteries currently is still in its infancy. However, trivial sums and back of the envelope calculations have never been an obstacle for those who truly believe. The Litium issue, only one of many in the long road of energy storage. What they really need is Kryptonite. However global reserves are zero. Regardless of this your analysis is correct – there are going to be serious issues around Li supply , especially if we try to ramp up to 1 billion cars & light trucks – the current world fleet. That would need a lot of giga-factories ! You’re right. Charging and discharging batteries can be at most 75% efficient for new batteries falling to ~50% with age. Lifetimes are at most 10 years. Fusion is the Holly Grail for future energy. It is a shame we are wasting 100s of billions on renewable energy rather than investing 10% of it in Fusion research instead. Good article Clve, I’ve been working on a similar analysis for Ireland using Pumped Hydro ( we would need around 1.5 TWh for a week ) and my figure is around $300B give or take the odd $10B. We would have to use Seawater and flood glacial valleys, maybe 20*5GW capacity. Basically current RE cannot scale and nuclear is hamstrung in most democratic markets. The anti-nuclear environmental movement gets far too much publicity and has been driving policy in the wrong direction for too long. Our grids are being designed by idealogists. Engineers and Scientists need to shout louder. I doubt whether Ireland has enough glacial valleys to flood with sea water. The largest pumped station so far is Dinorwig in Snowdonia with a peak capacity of 1.7 GW. It cost £0.5 billion in 1980s. So at today’s prices a similar project would cost at least £ 5 billion. The problem is that the number of suitable sites are limited and flooding huge areas destroys existing environments. All green solutions swallow up huge areas of countryside and destroy the environment they purport to protect. Wood is a renewable fuel. We cut down 90% of forests in Europe for heating and building. Now we want to cut down other people’s forests and ship them to our ex-coal power stations to meet arbitrary carbon targets. So, I gather that you objected to ITER from the point of view of its organization, rather than the suitability of the technology applied in it. I totally agree with the ridiculous way the project has been set up, that’s why I left it after a few years…. no way to see it finished in my professional lifetime… but from the point of view of the technology and feasibility I’d say that it is rather sound. Beware that when you read in the press “the cost of ITER has gone up X times blah… blah.. blah” this doesn’t mean at all the cost of the OBJECT… it is the lifetime cost including decades of operation, decommissioning and dismantling, restoration to green field. Just to make a comparison of “how big” these costs are… the whole project is estimated at 15 billion Euros? (will go up, don’t worry)… Italy alone spends 6,7 billion Euros/year to “incentivize” 24 TWh of PV electricity… so what is the big problem considering that behind the EU part (5/11 of the projected costs) there are 29+ Euratom countries, and the remaining 6/11 of the cost are 1/11 to each of the 6 other partners? I really don’t get this “huge cost”, do you? This may or may not happen by around 2030. 2) that you can make materials to withstand the very high radiation flux caused by high-energy neutrons from the plasma ( 14 MeV ) at the first wall . 3) that you can make materials to withstand the very high heat flux ( equivalent to 15% of that on the surface of the sun ) that will prevail in the exhaust ports. Whether or not any type fusion per se ( there are a number of technical pathways out there ) can work is anybody’s guess but ITER, apart from its technical challenges, also faces political ones. I’m an engineer and not a fusion specialist ( although I have studied it extensively & my sense is that this is a project being run by scientists eager to prove their particular pathway is the correct one rather than being a project that is ever going to produce commercial-scale fusion energy. 2) one doesn’t need to do this “subsequently”, i.e. only after ITER is built and runs… in fact the whole 7 partners ITER agreement included the IFMIF facility (to be built in parallel to the tokamak originally in Japan) exactly to do this… generate copious amounts of high-energy neutrons capable of reproducing the DPAs expected in the ITER first wall materials. 3) Materials capable of sustaining very high heat fluxes exist already, the heat flux levels are not an issue as far as I can remember… remind me, please, what heat flux levels are your referring to? Thanks. 4) Lifecycle analysis and LCOE estimates about tokamak-based fusion power exist already, they are available and printed on peer-reviewed journals, such as Fusion Engineering and Design, or proceedings of fusion conferences like the SOFE series… I’m sure I’ve seen a poster when I was in Porto for one such confererence in 2010 (2011?). “Optimal design of a toroidal field magnet system and cost of electricity implications for a tokamak using high temperature superconductors”, Fusion Engineering and Design, Vol 98–99, October 2015, Pages 1072–1075. If anybody is interested in having a full pdf copy I can download and share it privately, no problem. Easy peasy. It only needs a building 400m high x 400m x 400m in plan to house all these batteries or being of a more sensible size construction, 20m high x 64000m long x 50m wide. 64 km of building!! If applied to the UK that is nearly the full distance across one of our smallest counties. Perhaps not quite so easy!! !